It’s hard to believe it’s been twenty years since that movie first came out! It’s still one of my all-time favorites. Anyhow, I digress…back to the pie. 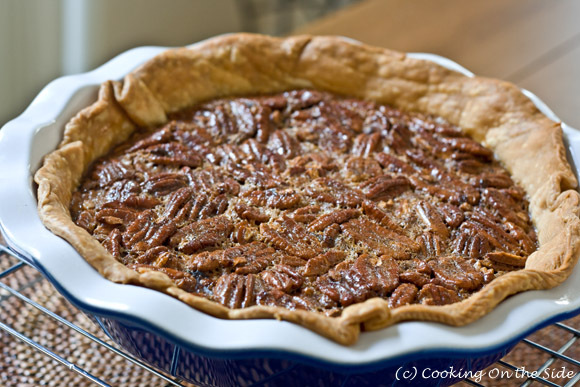 When I first started this blog, Lydia from The Perfect Pantry commented that she had just baked the pecan pie recipe from the KARO syrup bottle – right away I made a note to myself to give this one a try come holiday time (by the way, “pecan pie” makes Lydia think of When Harry Met Sally too!). It’s the one, all right – incredibly rich and sweet. 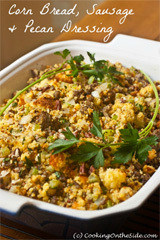 It takes all of five minutes to combine the filling ingredients, pour them into a pie shell and pop the pie in the oven. After that, you get an hour of olfactory enjoyment as the pecans and sugar slowly but surely caramelize away. 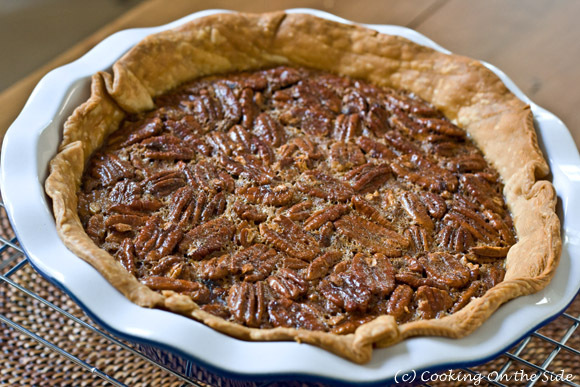 On Thanksgiving, in my mind the pumpkin pie suddenly becomes “the healthy one” vis à vis the pecan pie. For the sake of balance, I make sure to enjoy a sliver of both. Stir the first 5 ingredients thoroughly using a spoon. Mix in pecans. Pour into pie crust. Bake on center rack of oven for 55 to 60 minutes. Cool for 2 hours. Tips from KARO: Pie is done when center reaches 200°F. Tap center surface of pie lightly; it should spring back when done. For easy cleanup, spray pie pan with cooking spray. If pie crust is over-browning, cover edges with foil. * The recipe doesn’t specify salted or unsalted butter, but since no other salt is called for I chose to use salted butter. Great post!! And great looking pie! I love When Harry Met Sally!!! Did you know that entire scene was ad-libbed? Billy Crystal just starts going off into this character and the director tells Meg Ryan to just go with it! Love it! YUM!!!! I would much more prefer this pie over pumpkin any day! 😀 What a great photo. 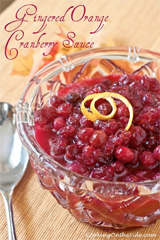 .-= Memoria´s last blog ..Thanksgiving Meal/Recipe List =-. .-= Scorpio Woman´s last blog ..Friday, time for a drink? =-. All great recipes have the oven temp required in them, update to show oven temprature. I couldn’t agree with you more and hadn’t realized the omission until now. 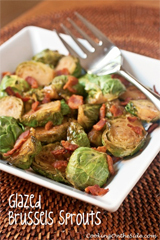 The recipe is now updated – thanks so much for bringing it to my attention! Perhaps this is a dumb question but do you use salted or unsalted pecans?